A svector normal to the plane of the current loop (in the direction of the angular velocity vector of the current about the center of the loop) with magnitude equal to the area of the loop d =magnetic dipole moment fi ^magnetic permeability The permeability of vacuum, ¡i^ has the following values, by definition: /Xg= I (dimensionless) EMU IUo^ttxKT7 N/A2 SI Therefore, in electromagnetic units in vacuum, magnetic induction and magnetic field strength are equivalent and the magnetic moment and magnetic dipole moment are equivalent. For practical purposes of magnetostatics, space is a vacuum but the spacecraft itself may have p # ft«. 1. Allen, C. W„ Astrophysical Quantities, Third Edition. London; The Athlone Press, 1973. 2. 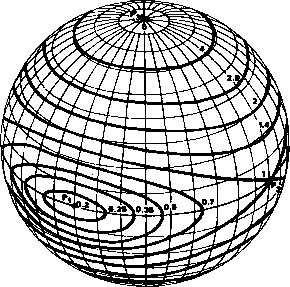 Mechtly, E. A., The international System of Units: Physical Constants and Conversion Factors, Second Revision, Washington, DC, NASA SP-70I2, 1973. 3. Müller, Edith A. and Arndst Jappel, editors. International Astronomical Union, Proceedings of the Sixteenth General Assembly, Grenoble, 1976. Dordrecht, Holland: D. Reidel Publishing Co.. 1977. 4. National Bureau of Standards. U.S. Department of Commerce, The International System of Units (SI), NBS Special Publication 330 (1974 edition), 1974. 5. Newcomb, Simon, Astronomical Papers Prepared for the Use of the American Ephemeris and Nautical Almanac. Washington, DC: Bureau of Equipment, Navy Department, 1898.